. 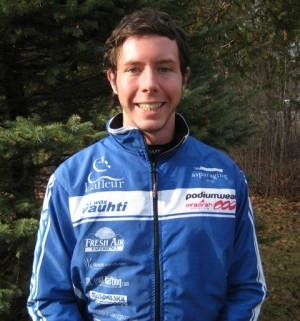 : Justin Demers :: Ski XCOttawa.ca :: Skiing in Ottawa and Gatineau Park :. Justin had a great rookie season with XC Ottawa two years ago, both in terms of rapid improvements to his fitness and technique and being the only guy among 3 other rookie girls. He is still improving rapidly while studying Mechanical Engineering at the University of Ottawa. He is training hard this season with goals of being in the top 30 at Canada Cup races and having some top 3 results at Quebec Cups as a third year senior. He has been voted to have the nicest legs on the team, third year running, and they just keep getting better. "My official position is that we should return to the golden age of lycra and bring back the metallics, purples, aquas and fluorescents. The Italians agree with me as Rudy Project has just released their Noyz glasses in fluor pink, yellow and green all with mirror blue lenses and ear pads. As far as xc ski suits go - if it ain't too bright, it ain't bright enough!"